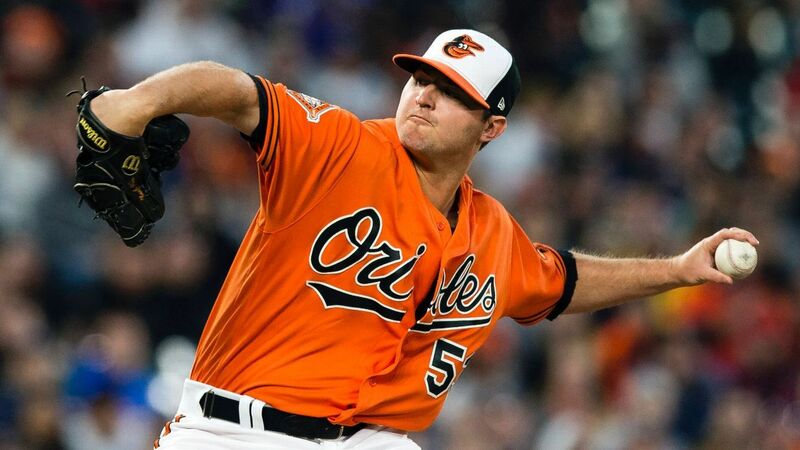 BALTIMORE — Baltimore Orioles closer Zach Britton took a significant step in his recovery from an Achilles injury Friday, throwing 20 pitches off a half-mound in the indoor batting cage at Camden Yards. Britton, who ruptured his right Achilles tendon while working out at home in California in December, was expected to miss six months after undergoing surgery to repair the injury. He said he hopes to return sometime around late May, when his stay on the 60-day disabled list ends. Britton will take another step in his recovery when he participates in pitcher’s fielding practice Saturday. He declined to predict when he might be ready to go on a rehab assignment in the minors. “When I started walking again, and then jumping, those were big moments for me,” Britton said before the Orioles-Indians game Friday. “I had a little party in the gym for myself when that happened. Those were big things to get over mentally. But today was pretty big for me, getting back on the mound and pitching. The half-mound is half the height of a regular mound and minimizes the stress on Britton’s right foot when he lands. The Orioles initially built the mound to help reliever Darren O’Day return from a torn labrum in his hip in 2011. Britton, 30, has amassed 115 saves over the past four seasons after breaking into the majors as a starter. In 2016, he saved 47 games, logged a 0.54 ERA and a 0.84 WHIP, finished fourth in AL Cy Young balloting and made his second straight All-Star team. He’s eligible for free agency after the 2018 season. Last year, Britton suffered an oblique injury in spring training and was limited to 38 appearances during the regular season because of a forearm injury. Brad Brach, who has taken over the closer role in Baltimore in Britton’s absence, has a 2.35 ERA, three saves in four opportunities and a 1.43 WHIP in eight appearances this season. The Orioles were 5-14 and last in the American League East entering their weekend series against Cleveland.